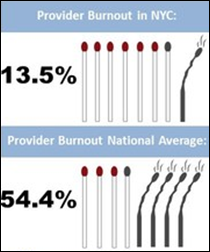 A study of 235 physicians working in New York City-based practices with five or fewer MDs finds lower rates of burnout than the national average. Researchers from NYU Langone Health (NY) believe these smaller care settings give physicians a greater sense of independence and autonomy than that experienced by their counterparts practicing within the hamster wheels of larger medical groups and health systems. DrChrono offers end users access to Collectly’s digital billing and collections messaging services. Azalea Health adds public health reporting capabilities from Iron Bridge to its EHR software. Nimblr makes its appointment-scheduling virtual assistant available through Amazon Alexa. Primary care consortium Health Center Partners of Southern California names Victoria Abrams (VBA Physician Network Services) EVP of its Integrated Health Partners subsidiary. 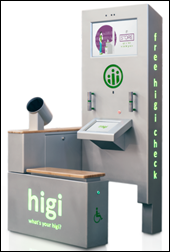 Health screening kiosk company Higi raises $21.3 million in a Series C funding round that brings its total raised to just over $61 million. The Chicago-based company’s 11,000 retail stations and app collect biometric data from consumers and their devices, which can then be shared with care teams. Atlanta-based chronic care management company Rimidi raises $6.6 million in a Series A investment round. Vein911 Vein Treatment Centers founder Christ Pittman, MD launches Health Performance Specialists, a Tampa, FL-based management services organization for independent physicians. ONC will award up to $40,000 in prizes to software developers who can demonstrate new and innovative ways to use Certified Health IT Product List data. Submissions are due October 31. MSK Group (TN) notifies patients at its orthopedic practices of a data breach first discovered on May 7. The breach, which the group stresses has not compromised patient or employee information, involved several instances of unauthorized system access over several months. AdvancedMD acquires competitor NueMD. Terms of the deal were not disclosed. Mr. HIStalk is running his annual Summer Doldrums Special on sponsorships and webinars. If you’ve been considering becoming a sponsor, now is a great time to take advantage of special rates on great benefits. Email Lorre for more information. 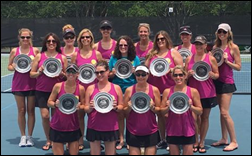 I am back on the grid after taking time off to shuttle family members to the beach and summer camp (for my second stint as a “counselor”), and to help my tennis team earn a spot in the playoffs. Summer tennis poses a unique set of challenges thanks to soaring temperatures, oppressive humidity, and shifting vacation schedules. Matches are almost more about staying hydrated and upright than winning. I seem to suffer more from muscle strains during warmer months – a problem that culminated in a minor calf injury just before I officially unplugged. Before heading to Dr. Google, I took advantage of telemedicine to ask the on-call physician for advice on how best to treat the affected area. It was free thanks to my health-sharing plan, convenient, and informative – characteristics that fly in the face of recent headlines declaring telemedicine a bust. In North Carolina, Mecklenburg Medical Group physicians drop their lawsuit against Atrium Health and its non-compete policies. 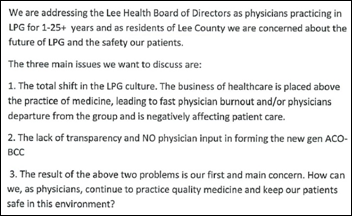 As reported here several weeks ago, MMG physicians will open the stand-alone Tryon Medical Partners practice after Labor Day. David Guthrie (Guthrie Technology Services) joins PatientPoint as chief product officer. Practice management company United Derm Partners hires Brian Hoffman (Sound Physicians) and Shelley Olesen (Modernizing Medicine) as VPs of development. Sevocity announces GA of software that combines EHR, practice management, and billing technology. SeniorWell selects PracticeEHR technology to better enable its mobile healthcare services for nursing homes. 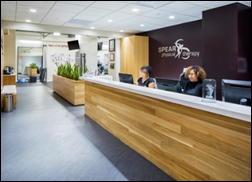 Spear Physical Therapy (NY) selects RCM solutions and services from WebPT-backed BMS Practice Solutions. EVisit flouts media wisdom and launches virtual consult services aimed at pre-diabetics and diabetics. A literature review of 22 studies conducted in nine countries finds that patients who stick with the same physician over time live longer than those who doctor-hop. The finding highlights the need for patients to find – and stick with – a family physician they can trust, as well as the need for newer care access points like retail clinics, telemedicine services, and urgent care centers to make sure they are embedded within the care continuums of their local practices. DNA testing seems to be garnering its fair share of privacy- and government-related headlines this summer. I wonder how many consumers contemplate the shift in family relationships that may occur once they get their results back. Conversations around my vacation dinner table made it clear that the potential for finding long-lost relatives – or family members you didn’t even know you had – becomes greater once you join the databases of companies like Ancestry.com and 23andMe – repositories from which it’s all but impossible to delete your data. Australia’s HealthEngine physician review and appointment-scheduling website temporarily shuts down its user review system after discovering identifying information had been left exposed in its source code. The data breach is the latest in a string of missteps that has also led the company to cease its third-party referral service and banner advertising. Founder and CEO Marcus Tan has promised to create an advisory group to help better steer the company’s future products and services, and to give users better transparency and control over how the company uses their data. Greenway Health hires Richard Atkin (Vista Equity Partners) as CEO following the departure of Scott Zimmerman, who has left to pursue other opportunities. Atkin’s health IT tenure includes leadership stints at Vista Consulting Group, Sunquest Information Systems, and Allscripts-Misys. Fun fact: Matt Hawkins, who was CEO of Vitera when it was acquired by Greenway in 2013, replaced Atkin as president of Sunquest in 2014. 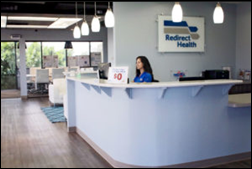 Redirect Health will implement CareCloud’s practice management and EHR software at the clinics and outpatient surgery centers it manages across Arizona. Private equity fund Francisco Partners considers putting specialty-focused EHR vendor Nextech Systems up for sale. App-based pregnancy and postpartum care company Babyscripts acquires competitor IBirth for an undisclosed sum. IBirth founder and CEO Judith Nowlin will become chief growth officer at Babyscripts. EHR and practice management company Compulink changes its name to Compulink Healthcare Solutions. The rebranding coincides with a 20,000 square-foot addition to its headquarters in Newbury Park, CA, where it employs 160. Healthwise CMO Adam Husney, MD will also assume the responsibilities of president at the evidence-based health education, technology, and services nonprofit. Allscripts-backed Practice Fusion will funnel health data from EHR end users to Icon, a drug development and commercialization services company that will use the data in its health research. Initial areas of study will focus on real-time identification of eligible patients for research studies, data collection for late-phase and post-market research programs, and registry development. 1.800MD launches NaviGo Health, a portal-based set of healthcare tools that includes virtual consults, pharmacy and mail-order discounts, liaison services that include bill negotiation, and real-time insurance eligibility verification. EWellness secures a $1.5 million investment from Triton Funds that it will use to expand sales and marketing efforts for its telemedicine-based Phzio physical therapy technology. 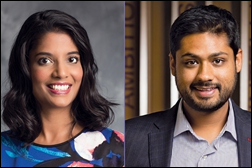 After cutting its staff headcount by half and bringing on a new CEO, Outcome Health announces that founders Rishi Shah and Shradha Agarwal have stepped down from the Board of Directors in an effort to “provide clear leadership transition for the new management team.” Board member and Portage Point Partners managing partner Matthew Ray has taken over as chairman. The medical waiting room advertising company was valued at $5 billion last year, making Shah and Agarwal one-time paper billionaires. Clinical dispensing software vendor MDScripts offers end users in Arizona, Indiana, Kansas, Massachusetts, Michigan, Ohio, Pennsylvania, and Virginia access to their state-based PDMP via integration with Appriss Health’s PMP Gateway. California-based HIEs SacValley MedShare and Connect Healthcare will merge. 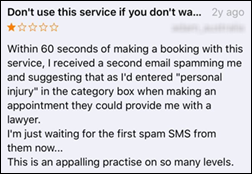 As the details behind CareSync’s demise continue to surface (Dr. Jayne’s latest Curbside Consult provides more inside scoop), my inbox continues to swell with emails from companies anxious to step into the chronic care management company’s shoes. 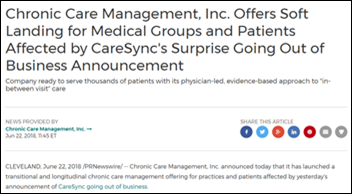 Chronic Care Management Inc., Revenue Maximization Group, and Sargas Pharmaceutical Adherence & Compliance International promise to “seamlessly transition medical groups and patients affected by the CareSync closure” to their respective CCM services. I saw the same phenomenon happen when Practice Fusion changed to a subscription model, and have to wonder how effective these marketing campaigns are (and how many Athenahealth competitors have already written press releases to a similar effect). Has a well-timed press release prompted your practice to switch health IT vendors after your main vendor made a significant change to its business model? Please share your experience in the comments below. The Aledade team celebrates its fourth anniversary with statistics and figures that point to a successful ACO venture thus far. The juxtaposition of its celebratory PR with the news of CareSync’s passing is an interesting one – one that makes me wonder how much leadership style and investor panache played a part in each company’s evolution. 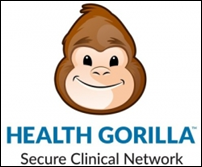 App-based medical record aggregator and services startup Health Gorilla raises $8.2 million in a Series A round. New York City-based patient billing and provider CRM vendor Cedar raises $36 million in a Series B funding round led by investment firm Kinnevik. The company has raised $49 million since formally launching late last year. Co-founder and CEO Florian Otto, MD helped launch Groupon Brasil and spent several years at ZocDoc before opening Cedar with AppNexus veteran Arel Lidow. Healthcare cloud services company NetGain Technology acquires IManaged Solutions for an undisclosed sum. IManaged Solutions offers similar services to optometry practices and EHR vendors. Founder Craig Rodrigue will join NetGain as GM of the IManaged business. Medicity will present at the Internet of Health event June 26-27 in Boston. Cardiologist Lynne Perry-Bottinger, MD files a $1 million John Doe lawsuit in federal court over an anonymous Healthgrades review that she believes was left by a competitor. 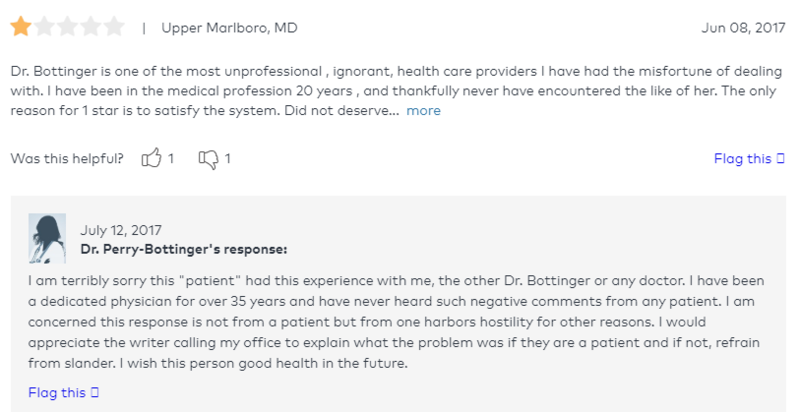 The suit accuses the reviewer of “false advertising, libel, unfair competition, and tortious interference.” Perry-Bottinger believes the negative review (click the image above to read) – one of a total of five for her on Healthgrades – has led several patients to cancel appointments. Healthgrades has refused to unveil the identity of the reviewer without a subpoena. Athenahealth will offer Epocrates end users drug therapy advice from Therapeutic Research Center via Prescriber’s Letters updates. DrChrono adds payment processing capabilities from Square to its EHR and OnPatient portal. Greenway Health integrates QardioMD’s remote monitoring devices and software with its EHR and practice management system. NoteSwift develops an API toolkit for vendors interested in adding the company’s Samantha virtual documentation assistant software to their EHRs. IGambit, parent company of data analytics management and remote monitoring business Healthdatix, will acquire chronic care management services company Winpoint Health for an undisclosed amount. Medication management startup MedX Services opens for business in Chattanooga, TN. 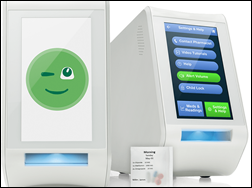 The company has developed an at-home medication dispensing and care communication system that will keep physicians, pharmacists, and caregivers in the loop when a patient misses a daily dose. I missed this last month: Boston-based IT services and support company Versatile launches a healthcare managed services division for ambulatory organizations. 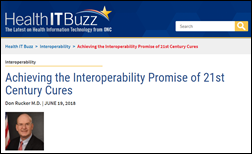 National Coordinator Don Rucker, MD offers an update on how the ONC is making good on the interoperability promises of the 21st Century Cures Act. 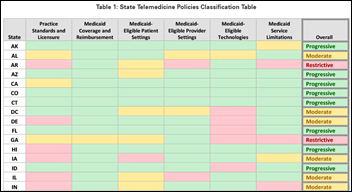 High-level items of note include encouraging the development of APIs to make health data more shareable, sharing best practices to help stakeholders avoid information blocking, moving forward with TEFCA (Trusted Exchange Framework and Common Agreement), and continuing to find ways to reduce the administrative burdens on physicians. To advance its MyHealthEData patient data-sharing initiative, CMS will host a Blue Button 2.0 Developers Conference August 13 in Washington, DC. This article profiles, Docity, a telemed startup founded by Marine Corps veteran James Cowan that is working to bring virtual consults to consumers through bundled offerings from their Internet service providers. It’s an interesting concept – one that the company pivoted to after attempting to stand up a direct-to-consumer telemedicine service. 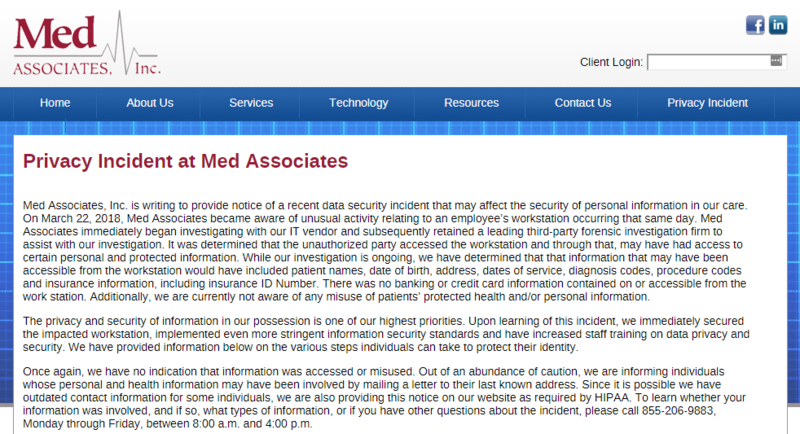 Latham, NY-based Med Associates notifies its billing customers of a March data breach that may have exposed the medical records of 270,000 patients. The company attributes the breach to unauthorized access of a workstation.